Discussion in 'Trek Gaming' started by Timelord Victorious, Apr 23, 2012. I've been playing infrequently, but will try and get that set up soon-ish. And yeah, should probably promote a couple more active people so we have better coverage. TJ, will try and get that going too. I'm kinder around. Most days I log in. Yet to decide if I am gonna invasion event. Yet to look at the reward. If something useful - might do it. Might do it for competitive marks. Took care of the coffer settings (they were new, apparently), and TJ got promoted to help out with things. Thanks Scout. Always glad to help. Um, it seems the leadership for House of TrekBBS has been transferred to Timelord Victorous and myself. Afaik, Timelord has stopped playing STO for some time now so effectively, I'm the sole fleet leader. And since I rarely play my klingon characters, I do not feel I qualified to hold the reins of the fleet. If anyone is interested, I can promote you. Um, so hi all. Sorry I haven't visited this site in a bit but I have been playing somewhat regularly and I saw the "Claim Fleet" button... never saw it before or knew it existed... So I came straight to this thread and read up. I then claimed the fleet... wow! So... all hail me...? lol! Seriously, I'm here for the fleet, Just email/message me in game if anything is needed. This is a first for me and I'll read up on it to make sure we stay in good condition. I've been playing since f2p and is still chugging along. If you don't mind, promote me to admiral? Hi all! For those of us still active I want to make a rallying cry to you and ask to push the K-13 base to tier 3. I know it a lot of dilithium but if we pull together we can do it. I try to be on most nights and check here once a day as well. Please let me know if anyone need help with anything. I don't know the status of the Klingon fleet... if anyone is till active there please give a shout out. If there is I'll re-link my Klingon there. Cheers! Greetings all! I wanted to give everyone an update regarding the fleet. It seems like our numbers were pretty bloated with players that haven't been online in years. I have been kicking out non-active members in an effort to get it down to mostly active contributing members. If you are a kicked member and you like to come back you can make a request here or message me while I'm online. My main handle is Tomas@galactic-roamer. If I don't respond you can also send me an in game email. I'm the PST time zone and try to be online most evening if noting but to check in. I will try and keep a project going to fleet marks for people to dump extra marks so fleet credits can be earned. It seems all current projects are pretty much frozen because they require dilithium which of course no one wants to part with because of obvious reasons. As for removing non-active members I have removed everyone not active as of this year. By the end of the year I'll cut that back to 6 months again in an effort to have only active members. If anyone has a request for a certain project just post it here or again contact me. I will soon begin recruitment efforts to get more active members. It also seems the armada we re apart of is pretty much dead as well and I'll be shopping around for an active one to join. My hopes are to bring this fleet back from the brink as no one in charge has been around for a while. This used to be a great fleet and I hope it will be again but I we need everyone help. I also encourage members to stop by here and just check in and say hello. In the end we are a community of players looking to have fun and community can be part of that fun too. I look forward to seeing those of us left online. 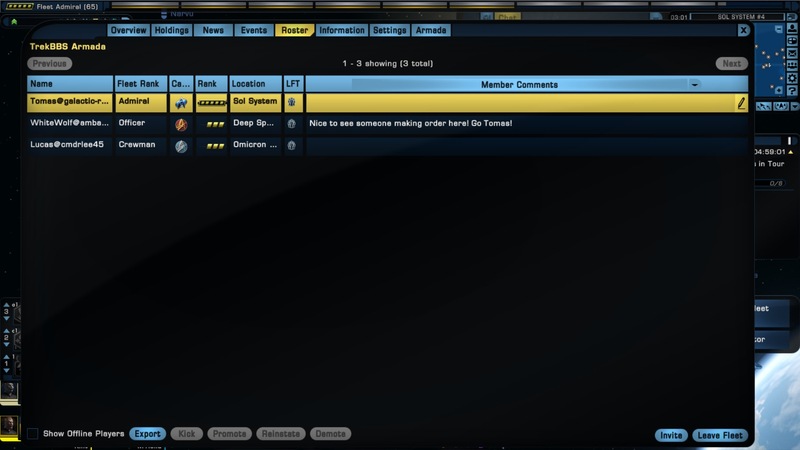 The problem is....STO seems a very quiet game. I have been playing years, and soloed the whole time. Even taking into account my sporadic playing, it doesn’t lend itself to the guild setup I remember from other games...partially because of time zones. I hear ya Jamie... Some people prefer to play alone. Hell, most of the time, so do I. Though I'm sure as you know, there is more than one reason to participate in a active fleet. Most of us want those juicy fleet holding consoles, unlocks, doffs, boffs and all that stuff. That means people at least contributing what they can to upgrade projects. Intrinsical and I have played a few pve missions together and pvp (let's not go into how badly he cleaned my chronometers). Participate only when and if you want but it would be nice for all to contribute and I hope people do. Evening all! So far there is no word from anyone from the House of TrekBBS our Klingon fleet, so I am declaring it now the Lost Klingon Fleet. I am still holding out hope to hear from someone from that fleet again at some point. If anyone still in that fleet happens by here please add me, my Klingon all is Torlek@Vgalactic-roamer. Not much to report thus far. We have a few active new members and a couple older ones but contributions remain low, probably due a lot of Jem'Hadar and Discovery leveling... I'll keep everyone updated here periodically. I encourage everyone to try and do some reciting, every extra hand helps. Until next time, see you in game. ^ I tried adding you, but it says you are already in a fleet. Oh right, I forgot! I'll leave it right now. Please send another when you get a chance. Thanks! Done. I pretty much play alone now days. Been a while since I did anything with friends or folks from here. Did see two in the video stream earlier today. intrinsical - is the offer of helping out more with the Klingon fleet still happening? I'm hoping to spend more time on my Klingon toons. Quick update folks. I did some cleaning of the fleet bank and got rid of old items that had been there forever unwanted. I have added a variety of items geared mostly for leveling,. I'm hopeing some find it useful. Enjoy!